I haven't posted here in quite awile, I'v had the flame blown out of building and lost interest in my car, a 63 type one, I have the body still off of it for the last five years and still haven't finished anything on it except to mount the 71 irs axel control arms to the 63 pan, along with new pans. 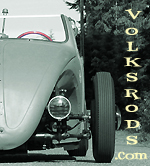 It is a roadster with an unfinished Duval style windshield frame. I have way to many parts to list. I also have posted parts for sale in the buy and sell section, man this is a tuff thing to watch go away but I just don't have the health to go on with it . I will most likely have some more tools for fab work for sale also, I'v sold some already. I have a brand new condition Lincoln 185 amp/ 220 volt Tig/stick welder with tank on factory cart pending right now but no money has changed hands yet. Give me a call ! I might be able to get some pictures from iside the garage area in a couple days.